FAQs: What is Stereotactic Body Radiation Therapy (SBRT)? What is required to perform SBRT treatments for localized tumor? Why should you have SBRT treatments at UCLA? What should you expect after SBRT treatments? UCLA’s Department of Radiation Oncology faculty offer the most advanced treatments to patients whose cancers range from the relatively common to the most complex and rare in a caring, patient-focused environment. UCLA is the first center in the area to install a new, state-of-the-art, image-guided device that provides more accurate, concentrated doses of radiation. Novalis Tx tracks the location of tumors during breathing and other movement, and delivers radiation with the highest precision. 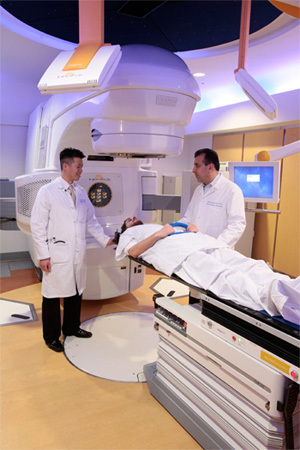 The device also shapes the radiation beam, mirroring the tumor’s size and shape. Novalis Tx is equipped with Varian’s RapidArc radiotherapy technology, delivering precise intensity-modulated radiotherapy (IMRT) up to eight times faster than other IMRT systems. Reducing the treatment time decreases the chance that patient movement will affect the treatment.